Earlier this year director Jason Wishnow launched a Kickstarter campaign to fund his latest short film. Mostly shot on location in China and starring world renowned artist Ai Weiwei, The Sand Storm premiered at Telluride over the weekend and is now available online. I'm still not exactly sure how this all came together. Wishnow was shooting in China without permits, making a movie starring Weiwei who has famously been under Chinese surveillance for years for his work speaking out against the government. However he's done it, Wishnow pulled it off and the nine minute short is an interesting watch, a relationship drama which unfolds in the wake of a sandstorm and a water shortage. 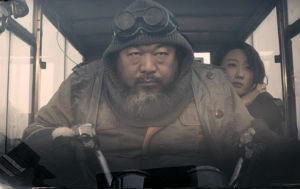 And go figure, Weiwei is pretty good in the role which perfectly fits his quiet persona.